The East India Company: the founders of Bombay? Samuel Scott’s ‘Ships In Bombay Harbour’ (1731) with Bombay Castle on the right. It’s 23 September 1668. The British East India Company has set foot on a bunch of islands leased to it by the British Crown. It makes its occupation official by establishing base at a Portuguese manor, and appointing a governor. It also sets into motion one of the most important developments in world history—the birth of the premier city of India, laying the foundations for the megapolis it is today. Last week marked the 350th anniversary of this occasion, even as the city that the East India Company raised has been rechristened Mumbai. This significant year will tick by without much ado, for which postcolonial city will pay respects to the arrival of a colonizer? However, history remembers. Commander Mohan Narayan (Retd), the former curator of the Maritime History Society, Mumbai, looks at it this way, “The city did not even exist under the hands of the Portuguese. They only gave it its name, Bombaim, but it was the East India Company that developed it into the modern urban centre it is known as today." Geography was inverted in those days—Salsette and Bassein, which today form the extensive suburbs of Mumbai, were in fact Portuguese urban centres, while the seven southern islets of Bombay were farms and fishing villages. That Bombay fell into the lap of the British through a dowry arrangement with the Portuguese in 1661 is now textbook history. Seeing it more profitable to lease Bombay, the Crown appointed the Company on 27 March 1668 as “the true and absolute Lords and Proprietors of the Port and Island". The annual rent: 10 gold guineas. In exchange, King Charles II got a loan of £50,000, at an interest of 6% annually from the Company. Around this time, Surat, where the Company had established its first Indian trading centre, was far more developed as a port centre than Bombay was. As Rashna Poncha, professor of history at Sophia College, traces, the Company had been eyeing Bombay for a while, for Surat faced two problems—the silting of the Tapi river and the Maratha warrior Shivaji. “The Mughals, who ruled over Surat, were left vulnerable against Shivaji, who had plundered the town twice. In Bombay, the Company saw the chance to turn the natural harbour into a great maritime centre along India’s western coast," says Poncha. The Company understood that a port needed supporting infrastructure, and it established a customhouse, a warehouse, a quay and a court, marking the very beginnings of a self-sustained urban centre in Bombay. The island of Bombay was fortified, too. Gerald Aungier, the second governor who held the position from 1669 until his death in 1677, accelerated the pace of Bombay’s development. He set up the first Anglican mint in Bombay, laid plans for land reclamation and causeways to link the islets, and authorized the construction of St Thomas Cathedral, the landmark that became the centre point of Bombay at that time. Beyond these, Aungier would be best remembered as the governor who pushed for the shift of the seat of power of the Western Presidency from Surat to Bombay, a wish that would materialize only a decade after his death. The transformation of Bombay from an idyllic prospect to megacity was accompanied by its cosmopolitan nature, one that was fostered by the Company. This was indeed the establishment that would stir the first rebellion from the Indian sepoys in 1857, but the Company, in the 1600s, knew that immigration would be its greatest business ally. Under the Catholic Portuguese rule, says Narayan, there was little religious tolerance, so much so that people were wary of settling here. “Religious freedom and the rule of the law were guaranteed by governor Aungier, and a whole lot of people migrated to Bombay, including Gujaratis and Parsis and also Jews and Armenians, and settled in the area around the Fort. Today, what we refer to as South Mumbai was is thanks to this move. It is with this cosmopolitanism that Bombay took its first step in transforming itself from a motley disparate group of islands into a bustling city," says Narayan. Governor George Oxenden, who preceded Aungier, “aimed at encouraging trade in all possible directions, encouraging people of all classes to settle on the island," writes historian S.M. Edwardes in The Rise Of Bombay: A Retrospect (1902). It would be nearly two centuries from 1668 when Bombay Fort’s walls would come down and allow for the continuous expansion of the city. Around this time, Bombay would earn the tag of Urbs Prima in Indis (the First City of India), as coined by journalist Mackenzie MacLean. While the facts must be read sensitively, the 350th anniversary raises a question that is bound to have many interpretations—who founded Mumbai? And, exactly which Mumbai are we talking about? Commodore Odakkal Johnson, the current curator of the Maritime History Society, says 1668 is a significant year, but not necessarily the pivotal turning point for Bombay. There is 1534, the year the Gujarat Sultanate signed the Treaty of Bassein with the Portuguese Empire. Or 1612, the year the Company’s galleons conquered the Portuguese in Surat, marking the start of their rise in India. Or, going further back, there was king Bimba, who ruled from Mahim in the 13th century, at a time when Bombay was called Bimbasthan. Johnson, however, concedes that the seeds of Bombay as the premiere city and the commercial capital of India were sown by the East India Company in 1668, as it joined hands with immigrants such as Parsi shipbuilders and Gujarati traders, as well as locals. As Poncha says, this may not be the year for fanfare, but it’s certainly not the time for forgetting, either. 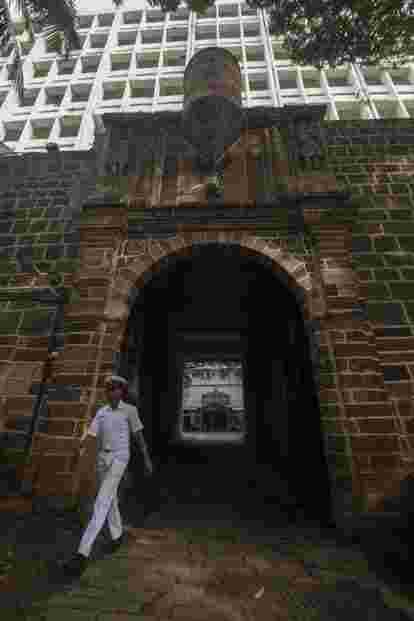 The Portuguese Gate that marks the entry into Bombay Castle at ‘INS Angre’. In the highly restricted quarters of INS Angre, the base depot ship for the Western Naval Command, is Bombay Castle. This is the very spot where the East India Company set up base on 23 September 1668. The Portuguese had divided the archipelago into manors, one of which was leased to Garcia de Orta, a Spanish Jew of Portuguese origin and a botanist. The Manor House, as it came to be called, was one of the early brick structures to come up in Bombay. De Orta died about a century before the Company took charge of Bombay. The Company built fortifications around it, turning it into the Bombay Castle. Today, you enter Bombay Castle through the Portuguese Gate. The gate is flanked by the friezes of two Portuguese soldiers, holding up the world in their hands—a symbol for the Portuguese ambition for world dominion. The Company built its fort walls along this gate, and the difference in construction is evident—Portuguese laterite is married to newer Kurla stones. Bombay Castle is put to use today as much as it was during the Company era, and has retained several of the original relics of de Orta’s manor.